Perhaps no other custom reveals our nation's original character as clearly as the celebration of Thanksgiving Day. Other countries have adopted similar observances, but America was the first to nationally recognize its dependence on God with a special day set aside for thanksgiving for His wondrous provision and deliverance. In 1777, during the War of Independence from England, the U. S. Continental Congress set aside a day for thanksgiving and praise for the decisive victory at Saratoga, marking the first time that all American colonies took part in such an event on the same day. The following year at Valley Forge, George Washington declared a special day of thanksgiving upon receiving news that France had agreed to provide aid. And later, as the fledgling nation’s first president, he responded to a congressional petition by declaring Thursday, November 26, 1789, as the first Thanksgiving Day of the United States of America. In this spirit, ICR invites all Christians--not just Americans--to again take part in this beautiful tradition wrapped in the deep heritage of our shared Judeo-Christian ethic, and deeper still in our hearts. We declare our gratitude to God for the many blessings He has showered upon our ministry, our lands, and our people. And in this season of Thanksgiving, we are most grateful for our abundant harvests and the productivity of our industries; for the discoveries of our laboratories through the work of our researchers, scientists, and scholars; for the achievements of our writers, clergy, and teachers, physicians, businessmen, and public servants, farmers, mechanics, and workers of every kind whose honorable toil of body and mind rewards them and their families and enriches our lands. Let us then thank God for our families, friends, and neighbors, and for the joy of this heritage of thanksgiving that we celebrate in His name. Let every house of worship, every home, and every heart be filled with the spirit of praise and gratitude and love for our Great Provider on this Thanksgiving Day. As the psalmist sang, "Unto thee, O God, do we give thanks, unto thee do we give thanks: for that thy name is near thy wondrous works declare" (Psalm 75:1). In this vein, won't you prayerfully join with ICR to see that His wondrous works are declared throughout the land? 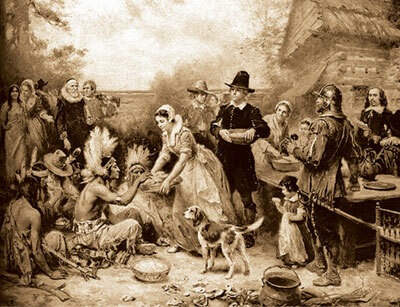 Governor William Bradford's Thanksgiving Proclamation, Plymouth Plantation, 1623. Cite this article: Morris IV, H. 2008. A Heritage of Thanksgiving. Acts & Facts. 37 (11): 17.